So we still have lots of eggplant coming out our ears and I’ve been scrambling to find ways to use it and enjoy it! 😉 Thanks to my sister who made some eggplant ‘meatballs’ that were amazing I decided to try and recreate a paleo version that my family could enjoy! I found a way to make it work and they were really good! The whole family gobbled them up and the kids were begging for the leftovers for lunch the next day! I think I might have to make a HUGE batch of these to freeze and keep for easy lunches. Now that we are back in school I have a hard time getting a decent lunch on the table before my kids who I swear have hollow legs melt down for lack of nutrition. If you were to be at our house one morning and not witness the 3 eggs and 2 sausage links with an apple and banana for breakfast, or the carrot sticks for morning snack, or the paleo chicken nuggets with sweet potato fries and fruit for lunch or the meat sticks for snack… and all that for my 6 year old before dinner is served, you would think we are starving our kids, they never get protein and that they are wasting away to nothing! These ‘meatballs’ were dense and pretty filling. The kids really enjoyed them and it actually filled them up and held them for quite a while! I was duly impressed! So if you suffer from ‘kids who are eating you out of house and home and they aren’t even teenage boys yet’ then this recipe may be just for you! Check it out! Slice eggplant and salt one side and let sit for about 10 minutes. Pat dry and repeat on other side. Bake at 400 degrees for about 40 minutes or until lightly browned and firm to touch. The version with cheese instead of quinoa is really good, but with dairy free kids we opted for the quinoa which was still good, but it isn’t quite the same as cheese! If you like LOTS of flavor then I would double the spices when using the quinoa. I served these plain with no sauce and then had salad and green beans on the side. I’m sure they would be good with a red sauce (although I don’t like red sauces) over spaghetti squash or [amazon_link id=”B005LMCD8E” target=”_blank” container=”” container_class=”” ]kelp noodles[/amazon_link]. I’d love to know what you think if you’ve made these before or have your own version! Also, what do you do when eggplant is in season and it’s coming out your ears? PS. I was a slacker and didn’t take a photo of the ‘meatballs’ before they were gobbled up. 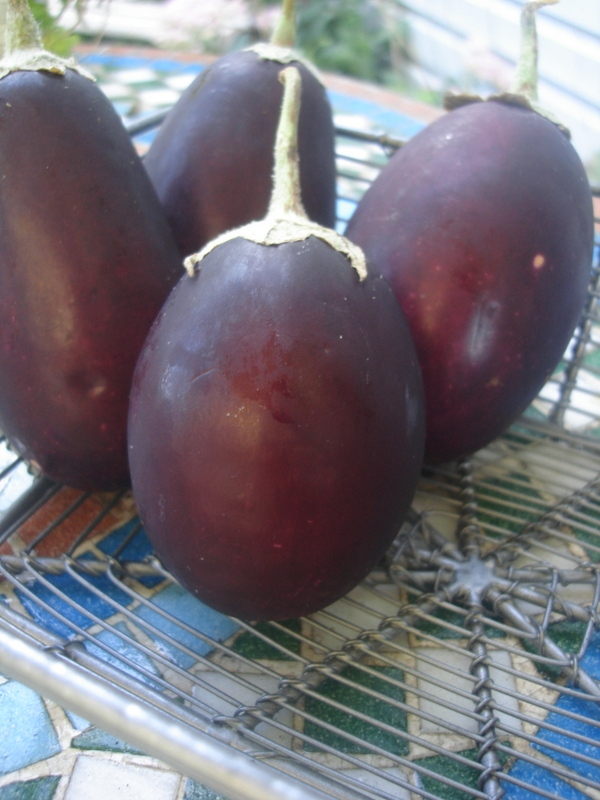 So unfortunately this post doesn’t have a photo of what they actually looked like… just the beautiful eggplants! Previous Our Vacation in Photos! These were awesome. Just finished eating them. Def making them again.